Today's recipe is restaurant style flavorful & irresistably delicious vegetable biryani. It is one of the most easiest & healthy nutritious dish of Indian cuisine. This popular dish makes a perfect main course for any special get-together parties. In this recipe, the long grain basmati rice is cooked with assorted vegetables & aromatic spicy masala in a single pot. It combines awesome with onion raitha & spicy curry. 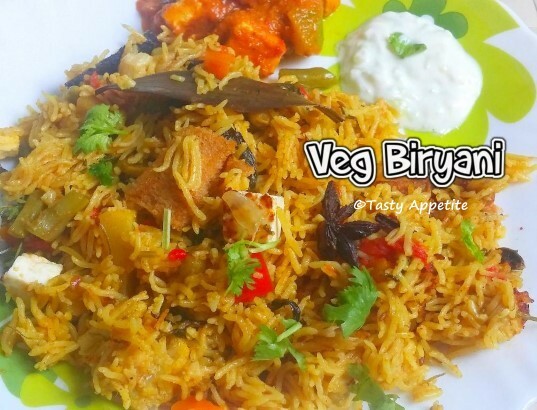 Lets see how to make vegetable biryani with this easy video recipe. Wash and slice all the veggies like carrot, potato, cauliflower, onion, tomato, green chillies, etc. Heat oil / ghee in pan. Add bay leaf, cinnamon, cardamom, star anise, cloves and allow to crackle. Add sliced onions, green chilly and salt. Add ginger garlic paster and saute. Add sliced tomatoes and cook. Add all the veggies and combine. Add turmeric pwd, red chilly pwd, coriander pwd, saunf pwd, biryani masala pwd and garam masala pwd. Add washed and soaked basmati rice. Combine gently with the masala. Add 2 & 1/2 cups of water. Taste and adjust salt & seasonings. Close the lid and pressure cook for 1 whistle in high flame. Simmer the flame and cook for 5 more mins. Once the pressure goes off, open the cooker. Lipsmacking delicious Vegetable biryani is ready. Thanks Saraswathy. Do lemme know.